Preface: Numerical Analysis 2000. Vol. 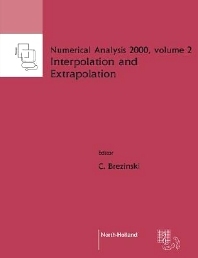 II: Interpolation and extrapolation (C. Brezinski). Convergence Acceleration during the 20th century (C. Brezinski). On the history of multivariate polynomial interpolation (M. Gasca, T. Sauer). Elimination techniques: from extrapolation to totally positive matrices and CADG (M. Gasca, G. Mühlbach). The ipsilon algorithm and related topics (P.R. Graves-Morris, D.E. Roberts, A. Salam). Scalar Levin-type sequence transformations (H.H.H. Homeier). Vector extrapolation methods. Applications and numerical comparison (K. Jbilou, H. Sadok). Multivariate Hermite interpolation by algebraic polynomials: A survey (R.A. Lorentz). Interpolation by Cauchy-Vandermonde systems and applications (G. Mühlbach). The E-algorithm and the Ford-Sidi algorithm (N. Osada). Diophantine approximations using Padé approximations (M. Prévost). The generalized Richardson extrapolation process GREP(1) and computation of derivatives of limits of sequences with applications to the d(1)-transformation (A. Sidi). Matrix Hermite-Padé problem and dynamical systems (V. Sorokin, J. Van Iseghem). Numerical analysis of the non-uniform sampling problem (T. Strohmer). Asymptotic expansions for multivariate polynomial approximation (G. Walz). Prediction properties of Aitken's iterated &Dgr;2 process, of Wynn's epsilon algorithm, and of Brezinski's iterated theta algorithm (E.J. Weniger). /homepage/sac/cam/na2000/index.html7-Volume Set now available at special set price! This volume is dedicated to two closely related subjects: interpolation and extrapolation. The papers can be divided into three categories: historical papers, survey papers and papers presenting new developments. Interpolation is an old subject since, as noticed in the paper by M. Gasca and T. Sauer, the term was coined by John Wallis in 1655. Interpolation was the first technique for obtaining an approximation of a function. Polynomial interpolation was then used in quadrature methods and methods for the numerical solution of ordinary differential equations. Extrapolation is based on interpolation. In fact, extrapolation consists of interpolation at a point outside the interval containing the interpolation points. Usually, this point is either zero or infinity. Extrapolation is used in numerical analysis to improve the accuracy of a process depending of a parameter or to accelerate the convergence of a sequence. The most well-known extrapolation processes are certainly Romberg's method for improving the convergence of the trapezoidal rule for the computation of a definite integral and Aiken's &Dgr;2 process which can be found in any textbook of numerical analysis. Obviously, all aspects of interpolation and extrapolation have not been treated in this volume. However, many important topics have been covered.